On a beautiful Sunday afternoon in the bucolic village of Pound Ridge, New York is a small church that is perched at the top of the hill at the intersection of Rte 137 and Rte 172. Within the hallowed walls of this classic structure, originally built in 1833, musical director and pianist Pete Malinverni and Pastor Lori Miller have fashioned a welcoming non-denominational environment where music is celebrated. Mr. Malinverni is a well known jazz pianist and has composed sacred music in various forms. 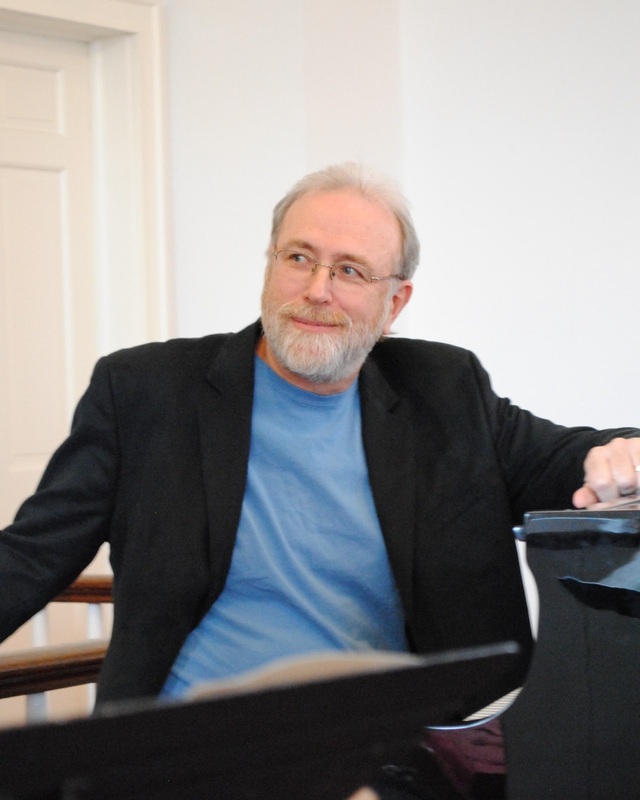 He is an active educator who has taught or presently teaches at New York University, William Patterson University and SUNY Purchase Conservatory of Music. 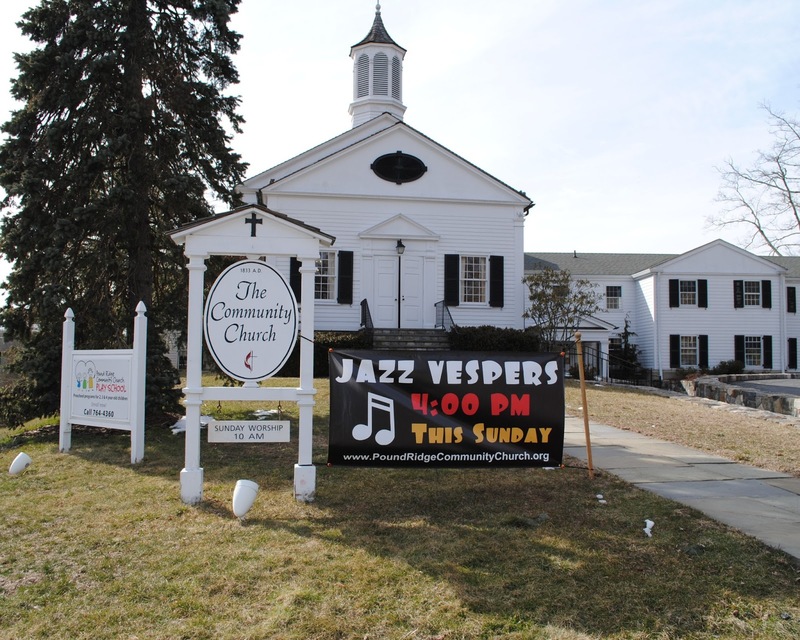 Since 2012 the church has used their Jazz Vespers series as an outreach to the community at large. On this Sunday the featured artist was the saxophonist Steve Slagle and his quartet. 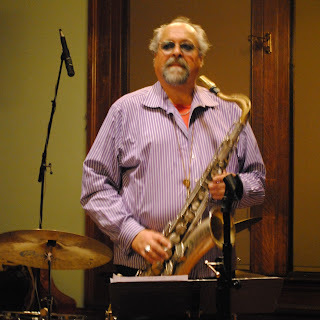 Mr. Slagle is an active musician who frequently plays and tours with his long time collaborator the guitarist Dave Stryker and has been a musical director of the Mingus Big Band for many years, He is an active collaborator with musicians as varied as Stevie Wonder and Milton Nascimento to the saxophonist Joe Lovano. His most recent release is entitled Evensong on Panorama Int’l Records and features Mr. Stryker on guitar, Ed Howard on acoustic bass and the drummer McClenty Hunter. that possesses a seemingly endless array of ideas. The drummer Mr. Williams, an animated participant, listens intently to whoever is soloing and compliments their lines with his own deft punctuation. Mr. O’Donnell, the youngest of the crew, seemed content to lay down a solid bass line and revel in the joy of playing with such accomplished contemporaries. For the second song of the set Mr. Slagle offered his own composition titled “Equal Nox” from his latest release. He explained the song was written on John Coltrane’s birthday, September 23, which is one of two days during the year when the day is equally as long as the night. With a cascading opening evocative of Trane and a catchy vamp, Mr. Slagle employed a searching tone to his alto. The quartet moved into the tight groove with O’Donnell's walking bass line anchoring the tune. Mr. Slagle ran arpeggios of sound that often crested in the high register, all done with superb control. Mr. O’Connell played a particularly syncopated solo, filling the lines in between his chords slightly behind the beat. 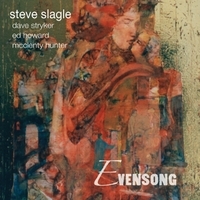 The third song of the evening was another Slagle composition, the song “B Like Me” from his latest release Evensong . Slagle played a series of liltingly smooth glissandi as Williams seems to prod him along with encouraging grunts and smart accents on the rim of his snare, the two enjoying the interplay. After a brief reading by Pastor Lori Miller that included a passage from the Bible, Psalm 107, and a reading of a poem by T.S. Elliot, Mr. Malinverni reintroduced the group. Mr. Slagle took up his flute to play the Carl Fischer/Frankie Laine ballad “We’ll Be Together Again” His sensitive sound was bright and airy, floating over Bill O’Donnell’s block chords and the plangent bass lines of Mr. O’Donnell. Mr. Williams lent elegant support on his brushes. The afternoon’s set ended with a composition by Mr. O’Connell titled “Pocket Change.” Mr. O’Connell is an accomplished player who in his own groups has a decidedly Latin inspired tilt to his music. This composition started in a quick paced 4/8 time changing at intervals to 6/8 time, confiounding the group at first, before they settled into the pattern of the rhythm. Mr. O’Connell’s playing was inspired with bursts of blazingly fast runs by his right hand. Mr. Malinverni, himself an accomplished pianist, watched on admiringly. Mr. Slagle negotiated the mixed rhythms of the song on his alto with graceful crescendos of his own. 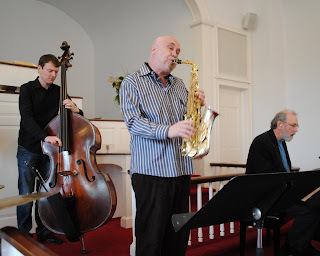 The congregation was duly impressed by his expressive performance and generously applauded the musicians in a appreciative demonstration of thanks and admiration. 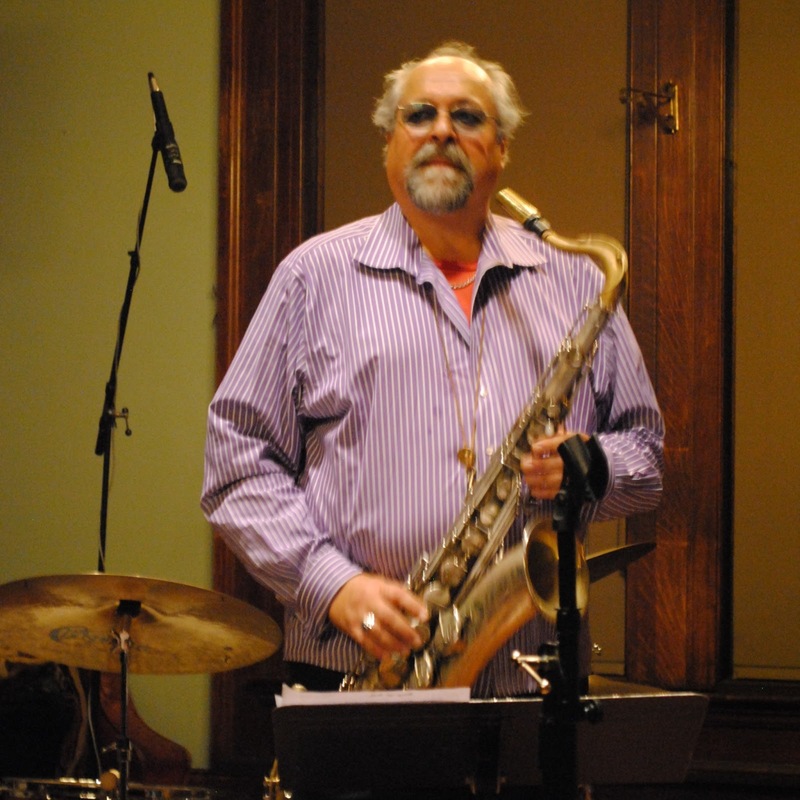 The Jazz Vespers series will continue on Sunday April 24, 2013 witha perfromance by the fine tenor saxophonist Ralph Lalama and his group. There is no cover but a generous donation for the musicians is highly recommended. The recently re-named Carnegie-Farian Room of the Nyack Library is a jewel of a performance space, with its aged wood and stone turn of the century interior finishes. The space becomes as much a part of the performance as do the players who grace its stage, burnishing the tones of the music played there. 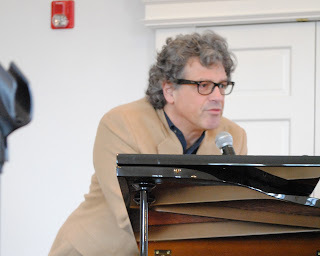 The Rockland Jazz and Blues Society and its President Richard Sussman, in conjunction with the Library’s Musical director Yashar Yaslowitz, have been putting on spectacular shows in this one hundred seat venue for several years. 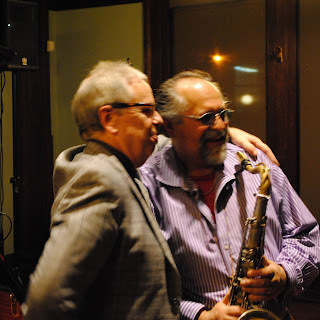 Friday night’s intimate duet, featuring the saxophone colossal Joe Lovano and the splendid piano virtuoso Kenny Werner, set a new high water mark for the series. The sold out crowd was peppered with musicians and cognoscenti. They all came to hear these two masters play in the living room setting that makes the Carnegie Room so special and intimate. Mr. Lovano is a big, burly man, bearded and jovial with a personality that emanates warmth. His predominant instrument is the tenor saxophone and he dominates his horn with a virtuosity and authority that few other present day players possess. His often brilliant improvisations are filled with nuance. He can create fleet, Coltrane-like, sheets of notes or he can hover between the notes, sustaining them, suspending them midair like a hawk floating in the thermals. His tone has a resonant timbre that lies somewhere between the sound of his predecessors Lester Young and Stan Getz. Forever the curious musician, he constantly challenges himself, frequently appearing as a sought after sideman or as the leader of his own ensembles. Mr. Werner is a brilliant pianist, a well regarded writer and a marvelous composer. His piano technique has classical elements, undoubtedly a product of his time with Berklee’s renowned piano teacher Madame Chaloff. He combines a healthy sense of the blues, with an adept ability to interject elements of romanticism into his probing free improvisations. He was a Guggenheim fellow in 2010 and has accompanied many famous musicians and leads his own groups. Mr. Lovano and Mr. Werner have a long history. Their familiarity with each other was apparent, especially on the freer pieces like the opening number, a Paul Motion composition titled “Conception Vessel.” The piece was like a dance through an enchanted forest led by tree sprites. 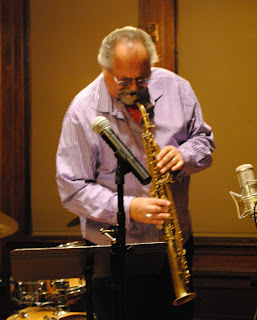 The sprites, Mr. Lovano, on his beautiful, Peter Jessens, custom G mezzo soprano saxophone, trading inquisitive lines with Mr. Werner’s delicate and sprightly piano musings. If you closed your eyes you could be transported to their hidden realm, suspending reality for a moment. Lovano played his tenor on the second song of the set, Mr. Werner’s composition “One.” The laddered piece was a perfect vehicle of conversation between these two intuitive compatriots. Mr. Werner offered a beautifully rambling solo which was countered by Mr. Lovano using a more searching sound. There is no map to where Mr. Lovano will lead you with his solos. He can burst forward with excitement, meander a bit in places, yank you by the collar pulling you into the abyss, embracing you ,enveloping you in a blanket of his warm sound, and you go along willingly, all to experience the magic of the moment. Mr. Lovano took to the drums on another free piece “Journey Within,” which is from Cross Culture, the latest album from Mr. Lovano and his group Us Five. Mr. Werner’s whimsical piano was accentuated by Lovano’s sporadic use of brushes and splashy use of cymbals. Mr. Lovano loves drums and in his Us Five Group he utilizes two drummers to great rhythmic effect. 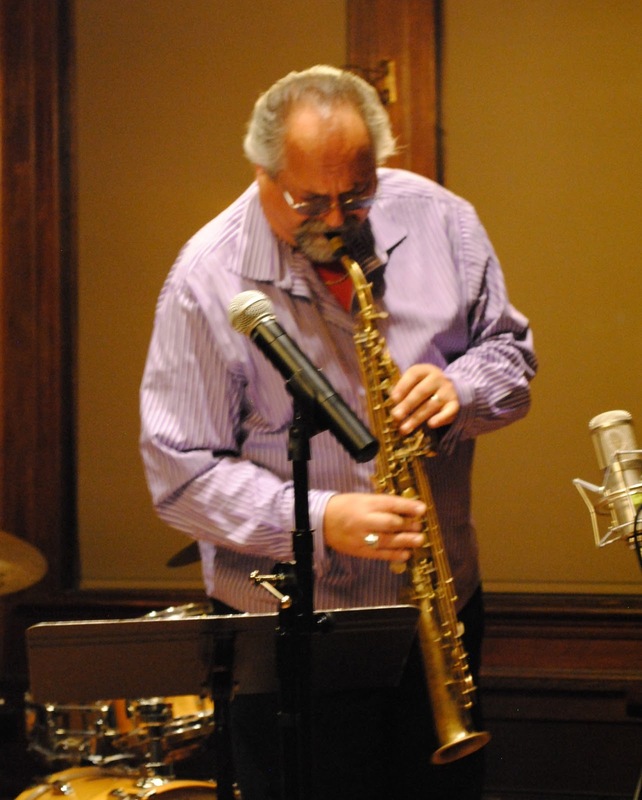 Mr. Lovano returns with his soprano, trading ideas with Mr. Werner in a playful exchange. Mr. Lovano‘s last piece of the first set was his composition “Weatherman,” dedicated to the saxophonist Wayne Shorter, who turns eighty this year. Joe's bellowing tenor ran through fluid lines, in the spirit of the elder master. Mr. Werner offered a deft accompaniment, his perky enthusiasm spilling out occasionally with audible refrains of Ah! when he liked what he heard. Mr. Lovano returned to the drum kit, keeping expert time, using a predominantly splashy sound accented by the occasional snap of the snare. With a steady rhythmic drive provided by Lovano, Werner was able to let free and offered a stirringly sensitive solo as Mr. Lovano nodding approval looked on admiringly. After a brief intermission, the second set started off with Mr. Lovano, this time appropriately on drums for another Paul Motian tune “Drum Music.” The piece was bombastic and punctuated with a repeating line, a theme that Mr. Werner would use as the basis for his own explorations, a free improvisational romp. Mr. Lovano’s drums didn’t keep discernible time so much as to provide accent. Mr. Werner’s composition “Five” was a slow sensitive ballad, with Mr. Lovano playing on his warm, full-bodied tenor with a poignant, beautiful lyricism. Mr. Werner was equally emotive, as he sat hunched over the black Yamaha grand, deep into the music, caressing the keys with his delicate, feather-like touch. These two musicians were absorbing each others ideas in mutually emphatic communion. The program continued to thrill, as the two played Billy Strayhorn’s “Star Crossed Lovers,” a song identifiable to most of the crowd. Mr. Werner created a short intro to the classic, leading to Mr. Lovano stating the melody on tenor. Joe can bring great depth of feeling to his ballad work, a combination of technique and warmth of tone that lulls you into a blissful state. Mr. Werner created romantic cascades of sound on his piano, with delicate flourishes that were especially effective on this poignant ballad. A Werner composition, “Go There and Roam”, was another chance for Mr. Lovano to play lyrically. With a cinematic-like theme, Lovano and Werner made this a high light of the evening. Together they wove a tapestry of sound that elicited a feeling of being transported to an unfamiliar albeit melancholic place. Joe, as percussionist, took up a grouping of netted shook that he used in rhythmic support as Kenny dug deep into the song. The crowd was understandably mesmerized. Mr. Lovano ended the set with his own lilting “Streets of Naples.” with its' Latinized beat and a catchy melody. 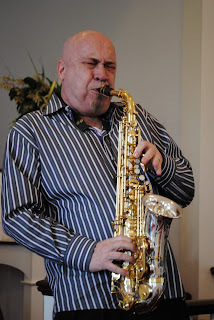 Joe's tenor sounding in the same spirit and with a similar gait to the way Sonny Rollins played on his famous ode to “St. Thomas.” Mr. Werner’s solo was particularly lively giving the tune a beautiful, care free feel. The two artists darted in and out of each other's ideas in a marvelous display of spontaneously developed musical choreography. The encore, a Werner composition titled “Ballad for Trane,” is a dedication to John Coltrane that Mr. Werner said came to him in a dream and practically wrote itself. Mr. Lovano can channel Coltrane at will, as he has proven on such recent albums as Steve Kuhn’s Mostly Coltrane album from 2009. He can produce a searching sound, the distinctively yearning sound of someone who is seeking out a higher truth through his music. The performance was an unqualified success and a very special evening for all those who attended. Fortunately it was recorded on video by the Library and you can link to it here. 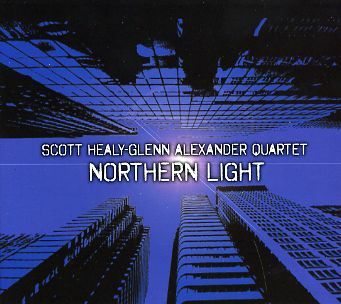 For an album that has been stowed away in the vault for over twenty years Scott Healy and Glenn Alexander's Northern Light has a taut, modern sound and sensibility. This enjoyable recording was taped by these two talented musicians back in December of 1991, along with the tight and elastic rhythm section of Kermit Driscoll on bass and Jeff Hirshfield on drums. You would be hard pressed to believe it isn't a current offering. 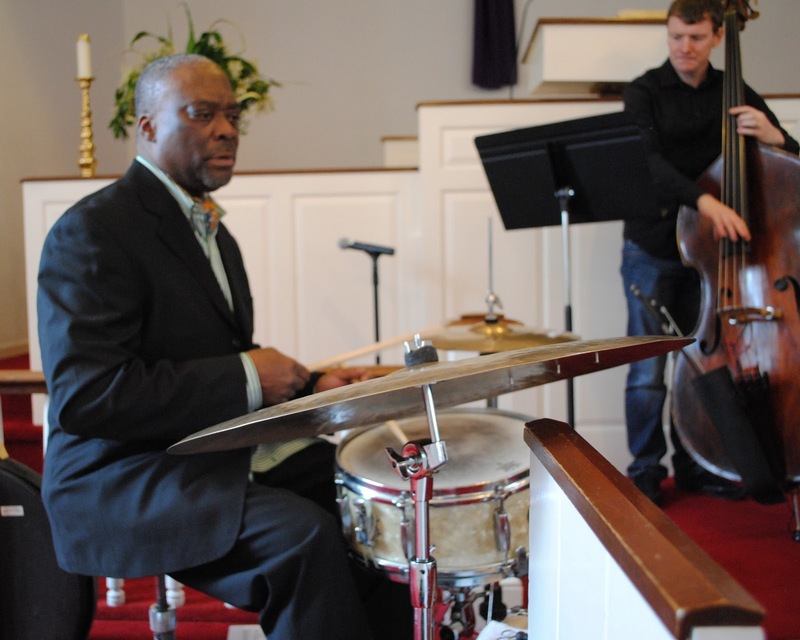 After this quartet disbanded, Alexander went on to some of his own projects playing with some prominent musicians in many genres, eventually landing a teaching gig first at the New School and then at Sarah Lawrence College in New York. Healy became full time pianist in the band on television's Late Night with Conan O'Brien. As teachers often do, Alexander found a cassette of these '91 sessions and played it for his students whose enthusiasm got both he and Healy to take another listen to what they had. They both agreed that the music not only held up well but possessed an extraordinary suppleness rarely captured on tape.They decided to release it on Hudson City Records in November of 2012. The music does have an organic quality to it, breathing at its own unhurried pace. The opening number "Spiral" is a case in point. Drummer Hirshfield seems to be able to let the fragmented tune float over a rhythm that has no appparent time. Instead the group sympathetically floats along a path created by Alexander's meandering Abercrombie-inspired guitar excursions. On Alexander's fetching "Christmas Day", Healey plays a beautifully darting piano solo reminiscent of early Lyle Mays with Pat Metheny with Alexander's guitar taking on a distinctive Metheny tone. melody. Alexander plays a warm and sensitive acoustic guitar solo that helps sustain the "down home" feeling of this song. Healy's piano work is beautifully conceived as he seems to lose himself in the solo with a Keith Jarrett-like wandering quality to his playing. On Glenn Alexander's "To the Point" we have top notch ensemble work. Healy's piano is poignant and pretty, while Alexander's use of modulating echoed guitar effects is perfectly suited to the airy feel of the piece. Driscoll and Hirshfield are superbly understated while maintaining creative support. "Chimes" is a beautifully realized ethereal piece. With Hirshfield's exquisite use of his cymbals, Driscoll's sustained and bowed bass lines and Alexander's masterfully controlled guitar work with its swooping violin-like sound. It is almost as if Healy is playing piano with his fellow musicians on top of a beautiful, open mountaintop meadow, the band in perfect harmony with its surroundings and the prevailing winds. "Chimes" has an open air freshness to it that transports you to that mountainside even when your sitting on the couch in your living room. The title track "Northern Light" has a 6/4 ostinato line that is played by Healy and with layered melodies by Alexander guitar and Driscoll's bass before Healy adds his synthesized keyboards ala Zawinul at the midway point. Healy and Driscoll have a brief conversation with Hirshfield adding percussive pops along the way. Alexander lays low until he re-enters when Healy restores the ostinato piano line. The song seems to hint at worthy points of departure within its structure, but the promise never seems to materialize before the song ends.